One of my favourite streets in Toronto is Draper Street. It’s quite short – just a small block running from Front to Wellington between Bathurst and Spadina. It’s also hard to come by; it’s easy to miss it amidst the mass of train rails that run on one side of Front, and the converted warehouses that house car dealerships and news headquarters’ on the other side. And there’s not a lot of foot traffic along that part of Front, so I don’t think it gets many happenstance visitors. But turning onto Draper gives you a glimpse into one of first Toronto neighborhoods. The small townhouses lining the street all have small oval plaques on them that include the date the house was built, its first resident, and its builder. Most of the homes were built in 1881 or 1889 and they originally housed a diverse group of people; a bartender, sailors, accountant, advertisers, dressmakers. It may only take a minute or two to walk through, but it’s a great opportunity to imagine waterfront housing 150 years ago, and those who have since moved out. Just west of this small taste of early Toronto is hidden an even older population of our city. But they haven’t moved out yet. At first glance, Victoria Square isn’t remarkable. It’s got some desire lines and a couple benches, people in suits criss-crossing to get to Bathurst or King. Mostly it always seems to be full of hip condo-ites walking their dogs. But set up diagonally across a small grass section of the park there is something remarkable. About 20 headstones mounted on marble slabs, some merely fragments of headstones, many weathered beyond readability. They are all that remain to remind passersby’s that they are, in fact, walking over top of the first European cemetery in Toronto. John Graves Simcoe was the first Lieutenant Governor of Upper Canada and founder of the British settlement of York. In 1794 he ordered that a cemetery be built a little Northeast of Fort York to house fallen soldiers and their families. It was on military reserve land that had no buildings on it by law. Actually, the first person to be buried there was Simcoe’s own infant daughter, Katherine. In the early 1800s, the bodies of those who passed away continued to be placed in this burial ground, with a number being casualties of the War of 1812. Parts of the military reserve began to be sold off starting in 1833, but the cemetery continued to be in use until 1863, when it housed about 400 people. Now it didn’t cease to exist in 1863, but Toronto’s growth meant there were other cemeteries that could be used, and that the city had other priorities for the area occupied by the initial garrison burial. Earlier, in 1837, there were grand plans made for Wellington Place (as Wellington St. W was called then) – it was to be a wide boulevard intended to create a fancy area for the Toronto elite to live and gallivant around in, and to fill in the relatively empty area as the populated city crawled Westward along the lake. So they created Victoria Square to face Clarence Square at the other end of Wellington Place, with the cemetery still occupying a large chunk of it. They had intended on building a number of churches to serve the local population, but the only one erected was St. John’s, which was built on the northeast corner Victoria Square in 1858. This map is from 1862. You can see Draper Street there, but those aren’t the houses that still stand today. Notice how wide Wellington Place is. You could rock like…4 lanes of horses both ways! Instead, the area mostly became occupied with industry. Warehouses, factories, centres for railway companies took over so Victoria Square never took as greenspace, as a reflective pedestrian area. Also, because the cemetery was not expanding, and not even really being maintained, and the area continued to shift away from an outlying region of a military hub to an outlying region of an urban hub, it got more and more neglected. 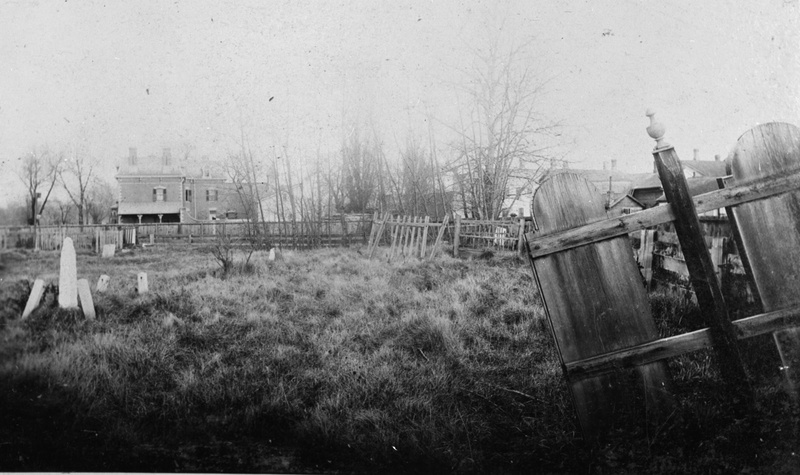 It was mostly just a fenced-in mangle of grass and deteriorating grave stones. The square was used as a cattle pasture for much of the latter half of the 19th century, and it was often vandalized (Y’know, people tagging things with stubs of charcoal and stuff. “Reginald was here” or “#1800s”). 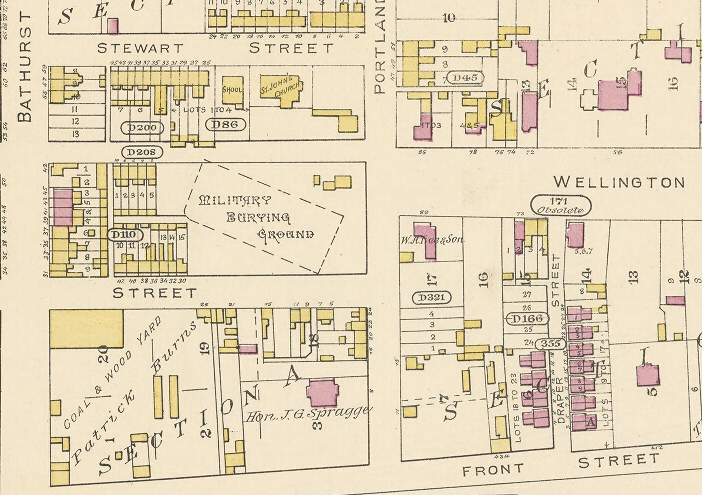 Then it got split in two in the early 1880s to capitalize on the amount of underutilized space that was proximate to downtown, and buildings got built on the Western portion of Victoria Square (which really became Victoria’s Rectangle if we’re being real), and the new northern section. If anything, this just increased the isolation of this forgotten memorial, cordoning it off from traversable places, and separating it further from the reverence of the only neighboring church. Map in 1884. Many of those Draper Street houses are still there today. Fun fact of the post, the burial ground is on such an awkward angle because it was actually supposed to have its four corners point to actual North, South, East and West. Clearly it was no longer the respectful military memorial JGS had envisioned. They had originally used wooden and stone headstones, and all the wooden markers were gone or destroyed, and many of the stone ones were broken, chipped, or otherwise in bad shape. Finally in 1899 the City gave the park a much needed makeover. They moved the remaining gravestones to line the fence along the western boundary of the park, leveled out the ground and put in some paths. 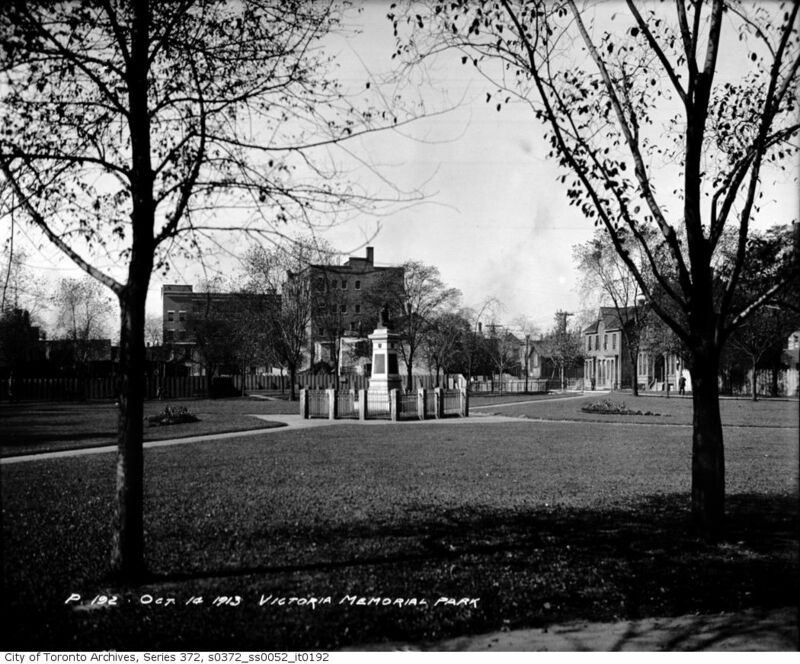 In 1907 they made a War of 1812 memorial in the centre of the square (rectangle), which still exists today. Victoria Square facing West in 1913. You can see the gravestones lining the wooden fence on the far side of the square. The permanent homes of the bodies stayed permanent, but their markers continued to shuffle around. They moved to Fort York in 1935 as the park continued to get improved, then were moved back to where they are today in the 1950s. Besides the slightly creepy feeling I now get from walking through Victoria Square, what’s the takeaway from this? Firstly, I think the saddest part of these tattered remains is the number of infants that are buried there. While more commonplace in the Canada in the 19th century than it is today, the effects of the death of a young child were surely just as devastating. Secondly (if you’re not interested in my convoluted soapboxing about historiography in general, you can quit here while we’re both ahead), the takeaway for me is the reminder that what we remember from history can so often be truly random. Or rather, the way things play out over periods of time is too organic to control what remains known and what slips into the unknown. 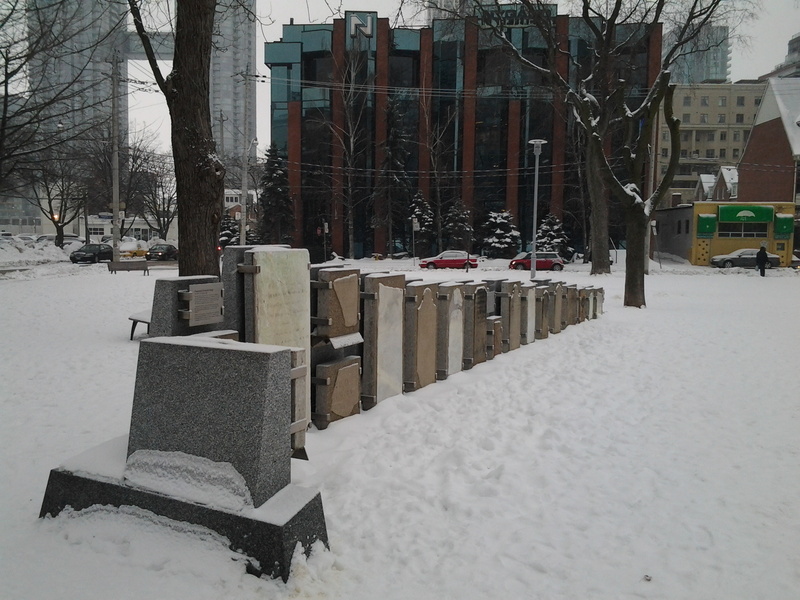 What if all the gravestones at Victoria Square were wooden? Would that mean that the reality of this being a burial ground would be lost on us today? Would we have lost it 20 years ago? Will something happen that will destroy the current grave stones so that this burial will be lost in another 50 years? What if a condo bid got Victoria Square and all that remains is a small plaque in the lobby? What if the dude who used it as a cow pasture decided he wanted to keep pigs instead? Or chickens? Or a laser tag course? Of course, what-if questions in history are infinite and really aren’t helpful, but my point is that it’s basically impossible to predict, in the present, what will be a what-if question in the future. How many palimpsests (yeah, that’s the word of the week), huge or small, lie around us that have been ignored or slowly forgotten? My takeaway of this is that I’m glad there still remains a reference to this former sense of place at Victoria Square, and that I think it’s important to keep being curious about what’s around you, but also what used to be around you, and what may have been lost or gained as a result of that change. Read the plaque, keep those eyes open, or explore your neighborhood. Or, at the very least, listen for the Hogtown Crier.